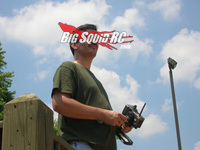 ASK Cubby, 04.09.2015, Version- You Send in Questions, I Dodge the Answers « Big Squid RC – RC Car and Truck News, Reviews, Videos, and More! Do you think any other manufacturer besides Kyosho will make a new 1/10 scale tracked vehicle? I love my Blizzard EV with the 540 brushless motor but its a bit fragile and parts are sometimes hard to find. If Traxxas, ARRMA or maybe even HPI could make one for the basher crowd do you think it would sell? They seem to have a much tougher drivetrain in vehicles over the Kyosho counterparts. Cubby- Ya know Kevin, that is a dream of mine as well. Actually not just mine, BSRC staffer Craig “The Uber Ramp Guy” has always wanted a wicked-azz tracked vehicle as well. And yes, I think our entire staff would go nuts over a gnar-core tracked vehicle. One that we could jump off of roofs, one that could make the triple at the local track, and one that could make 50 mph high speed passes. Because… none of the manufacturers stepped up to the plate on that one, we built our own version, the Axial EXO Terror Buggy. If you don’t remember it, check out This Link. Unfortunately, our version had too much drag to it, driving it felt like there was always wayyyy too much drag brakes on all the time, and we still couldn’t hit the kind of speeds that we wanted to without one of the rubber tracks coming off. So achtung hobby industry, make it and we will come. Heck, I’d even spend my own hard earned cash on one, and that is pretty gosh darn rare. Hope this email finds you doing well and destroying something that’ll make for a good read later. I’m looking for a little advice here. I have been given permission by the wife (sad, I know) to add one more vehicle to the fleet. I’ve narrowed it down to two and would like your thoughts on the matter. For what it’s worth…I live and bash in the open desert. I go big until it breaks and if you do catch me at the local track; I’m the guy trying to huck over the fence or hit that gap the racers can’t even fathom. I currently own a 1/10 scale yeti and an SCTE. Thanks for your all that you and your crew do for the bashing scene. Cubby- Yo thanks for the kind words Wes. And ya, we do what we can for the bashing community. For the longest time the media, as well as certain manufacturers, shunned bashers like they were second class citizens. I would like to hope that we’ve enlightened a few people that bashers are the grass roots of rc, as well as the majority of people spending money in this hobby. Ok, you say you mainly bash out in the open desert. First off, you don’t know how lucky you are. Where we live the only places to bash are city parks, which don’t offer much for gnarly terrain. And… if you make too much noise or look at some soccer mom the wrong way the cops show up to run you off. Secondly… because you bash in the desert the choice is quite easy IMO, you should go with the Axial Yeti XL. Its big tires and decent ground clearance makes it the obvious choice over the Durango. Yes, the Durango 408v2 is a Great basher with incredible handling and good durability, but out in the open desert its low ground clearance will work against it. Finally… and good for you for going big and taking names. Some people don’t realize we are driving around toy cars that are ok to break once in a while. They should NOT be shelf queens, or pampered, they should be used to their maximum potential (and beyond). That’s it for this week ya bash-a-holics. Shoot me an email- Cubby at BigSquidRC.com is the addy you want. If your email makes the big time like Wes and Kevin’s did this week you’ll get a free BSRC sticker pack.